I wake before everyone else, and tiptoe around the squeaking floorboards, making my way downstairs to the kitchen. I try very hard not to wake the spouse, the child, or the dog. It’s my time, and if I’m lucky, I’ll have a half hour all to myself. The first thing I do is make coffee. Nothing fancy, just my Cuisinart 4-cup drip and some French Roast, already ground, because there is a worse noise than a coffee grinder especially first thing in the morning when you’re trying not to wake anyone else up, unless it’s a leaf blower. Some half and half and a favorite mug and then to the comfy chair to scan the headlines, check email, look at Facebook where I hope someone has shared a New York Times article because I’m too cheap to buy the app. I’m at my best in the morning, most clear, most fresh, most energetic. The rest of the family doesn’t really get it and I have to remember when I start sharing ideas or asking questions that they have not had the benefit of an hour of awakeness or caffeine. It’s a little dance and I am definitely leading. The others put up with me. I don’t know why I love the morning so much. Getting up before dawn often reminds me of travels I have been on – a safari when we rose with the sun so we could catch the animals at the watering hole before it got hot; a study trip in Israel, Egypt, and Jordan when we woke at 3am so we could see the sun rise from the top of Mt. Sinai. Jet lag, too, makes for early mornings but you can catch a sunrise while others snore. The beginning of the day has so much potential. Nothing much has happened yet, just coffee and a few headlines. What might unfold? What surprises await? Who will I see? What good news might break? Will the forecasters be wrong and we’ll have sunshine all day? Easter is a morning holiday; Christmas is an evening one. “Early in the morning” all the Easter stories begin. So much potential that day, though no one imagined it. Just a morning routine, the women getting up early, preparing their spices, taking their sad walk as the sun rose. And then – so much unfolded, so many surprises, such good news. Maybe I’m a morning person because I’m an Easter person at my core, believing in new life that awaits us, life where there had been death, blades of grass poking their way through the concrete. I hope to be that, anyway; it’s better than the alternative. I really hope and pray that today is a great day; it will be for some of us and not for all of us. But here’s to new life, and the ability to embrace it and make it happen. A very good morning – or good afternoon or evening – to you all. I’m at our family place with most of my FOO (family of origin). The house is big enough to hold all of us, though the septic tank gets a little cranky if we flush too often or shower too long. It’s great to see everyone, to come back to this place where we have gathered most summers of my life, to raise glasses and share reader glasses and tell our stories to the younger generations. It’s all good and harmonious – until we get to the morning coffee. We have four different ways of making morning coffee here, because none of us can agree on our Morning Foglifter (which is actually a Stumptown label that none of us has brought.) My sister has her wee french press for her “stick-a-spoon-in-it-and-it-will-stand-on-its-own” coffee. My parents have their own french press with special grinder for their strong-ish (emphasis on the “ish”) brew. My brother and niece grind their own in the morning and brew it, half-decaf. Me? 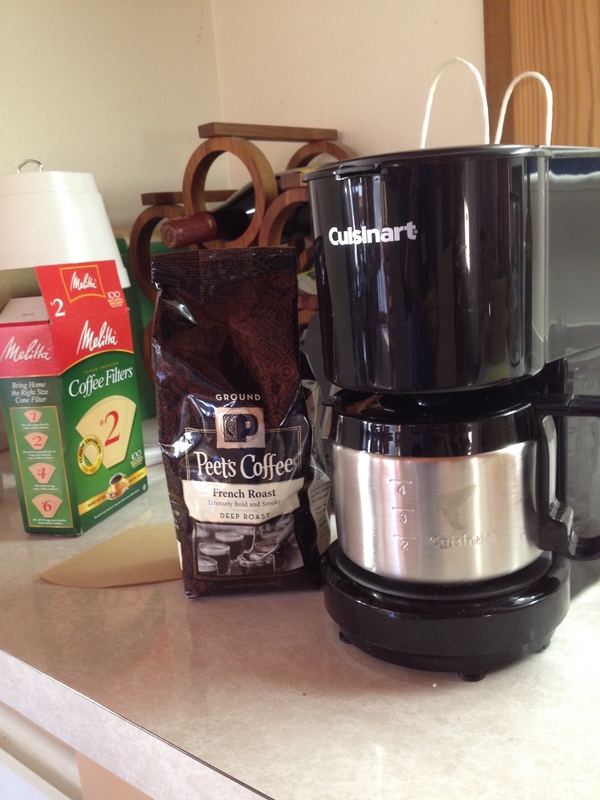 Well, last month I bought a Cuisinart 4-cup drip like the one I have at home, along with ground Peet’s French Roast, because the last thing I want to do before I’ve had my morning coffee is listen to a coffee grinder. Least Favorite Sound. Ever. It’s like the Fran Drescher of kitchen machines. I try not to read too much into the whole coffee thing. I try not to overanalyze the situation, not think that this is endemic of our familial inability to come together, to let go of our preferences and share in the common good, or the common ground, or the common grounds. At dinner we all manage to share the same bottles of wine; why not morning coffee? Truth be told, although most of us in my family are morning people there’s a limit to our morning-ness. We are up with the sun, but we don’t really want to engage with each other until we’ve been a little dosed with caffeine. Maybe there’s grace in allowing each other our individual brews. After all, my husband foregoes the coffee and reaches for the Diet Coke, and my sister-in-law is a confirmed tea drinker, and we love them. When we would come to this place when I was little, at the old house where we stayed before my parents built their own place, there was one percolater. Grandpa was usually up first, and the percolator was going, bubbling up in the glass lid-thing at the top. If you were a coffee drinker, that’s what you drank in the morning – no french presses, no coffee grinders, just a good waking up to Folgers. My grandfather, who had a magnificent, wry sense of humor, would laugh to see us these mornings. But he would be glad we’re all up here, whatever we might be drinking. So I raise my mug to him this morning, with gratitude for the gift of this place, and for my morning cuppa joe. So it’s Monday morning and I’m on my way to Starbucks. In my defense, I usually don’t visit Starbucks on a Monday morning, but there was a lot of gardening and the ensuing sore muscles yesterday, and the child woke me up at 2:30, and biology woke me up at 4:30, and the puppy woke me up for good at 5:30, and this week’s liturgy just needed a boost of caffeine. So I’m on my way to Starbucks, a two-minute walk from the church, and I pass a guy pushing a grocery cart with a big garbage bag in it, which I assume is filled with cans and bottles he’s planning to recycle for the 5 cent rebate. I’m on a mission for coffee, but I do think to myself, “God, bless that man” as I walk by. But in the seconds after I pass him, before I get to Starbucks, I think to myself, “Maybe God wants me to be a blessing to him.” And I go in and order my tall latte. I have brought $3.oo with me; the coffee is $2.65 and I put the change in the tip jar. I’m chatting with the barrista who’s foaming the milk and I hear the guy come in. “Have you seen my friend who was pushing the thing? Has he come out yet?” No, says the barrista. But then his friend comes out of the loo – an older gentleman wearing an Oregon State cap, pushing one of those walkers that has a basket and a padded seat. The gentlemen leave. May there be caffeine and the blessing of strangers for you today.